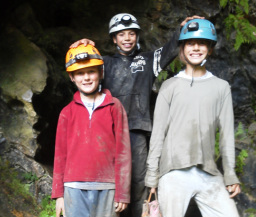 Campers will experience indoor and outdoor rock climbing, rappelling, camping, hiking, paddling, swimming, survival skills, caving, and other adventure activities in this 5 day experience of a lifetime. Knowledgeable and safety conscious guides will instruct campers the basic skills of all of these activities, and there will be plenty of practice time and first hand experience. Each day will be full of adventure and excitement. Outdoor overnights will be spent in the back country under the stars (or in a tent or hand-made shelter). Includes all food and all necessary technical gear.